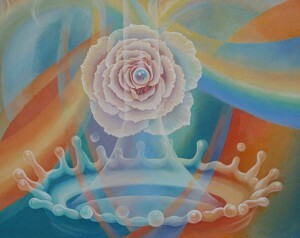 This is one of the paintings displayed in the Retrospective Gallery in my main website. The meaning of it may not be clear to most observers, so I thought I would write a bit about it…and what it means to me. Like many of the visions that come into my art, this one came in parts, like a flow, to me rather than from me. Like a gift…a prayer, inviting. The metaphorical gems, ( pearls? or drops perhaps? )….represent to me the entrance of a new idea, as it goes in, past the surface of the thinking mind…. 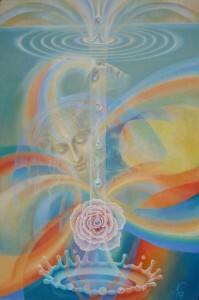 especially input from spiritual and Angelic realms…that expand one’s field of Seeing into energetic realms. The upper face looks upward, her crown and 3rd eye chackras are open, her eyes open and mind receptive. The face below is in a meditative reverence, as Divine nature enters then into her heart, a blooming rose, petals unfolding in rapture. The splash below is what I call Angelic Integration, as an actual alchemical affect results…the colors mix and blend and swirl as a transformation morphs the soul powerfully and deeply with Light. Jan, one of the great joys for non-visual artists like myself, is to be let into the inner sanctums of the creative process, that goes from an idea, a vision to be transformed into the final painting on canvas. I interpret of course in my own subjective way, many paintings, and “translate” them into verbal imagery, or what we call poetry. Sometimes I am “right on the mark” of what the artist was seeing too, and sometimes, I see more of course, colored by my own subjective experiences, and sometimes totally miss what they were seeing and feeling. How rare it is for us to be allowed in, and I want to commend your doing that here in your blog. It puts another dimension on to something that we found beautiful. intriguing, but maybe not in a way as spiritually deep as the artist herself was feeling and experiencing it..the flow coming to and through you as you say. Thank you for this gift of sharing your process, both in your most recent paintings and in ones from the past. It is all so fascinating to see the steps along the way to creating a beautiful and lasting piece of art. Your words mean a great deal to me, Karima. Until now, I haven’t tried to put words together to describe what my paintings are about…to me, or their process. It has been such a private, solitary, inner journey…and the beautiful visions that have come to me were often not even clear to me ( especially in words ) while i was painting them. But i sure did feel them profoundly…they were indeed magical gifts from another dimension. Creating a website and especially an active blog has been a surprise to me ! You give me feedback from someone i have such respect and admiration for, who is quite familiar with the mysteries of the creative process in your own amazing poetry and prose, who has followed and purchased my art for years….and understands it better than most. When you say that my words help you be let into the “inner sanctums of the creative process”, to go more deeply into understanding my art, then i must be doing something right. Thank you so much for your heartfelt support and feedback. It is mutual!